$112,906.69. 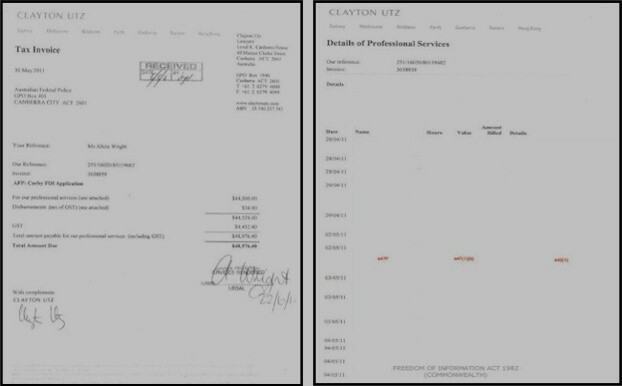 This is the sum the Australian Federal Police (AFP) had paid to prestigious Sydney law firm, Clayton UTZ, as at 30th May 2012, to help prevent Schapelle Corby from accessing information held on herself. But even this is a mere scratch of the surface of the total costs. The figure does not include Clayton UTZ fees for the AAT hearings of July 2012, which are anticipated to have substantially increased this figure. Nor does it include the costs expended in the deployment of a number of third party individuals, including from the intelligence agencies, such as the Inspector General of Intelligence and Security, Vivienne Thom. Also excluded are costs such as those spent on live video links from Canberra to the hearing in Brisbane, and of the AAT itself, which may well exceed those of Clayton UTZ. Finally, the cost of the countless man hours of the AFP in fighting this case is also excluded. It is estimated by third party analysts that the total cost to the Australian taxpayer easily exceeds $1 million. [Further Clayton UTZ Invoices, As Submitted To The AFP] . This ongoing saga began four years ago, as Schapelle Corby sought answers to the many outstanding questions which surrounded her flight to Bali. These included the issue of the missing CCTV tapes from three Australian airports, the false and damaging statements made by the AFP during her trial, and the disturbing circumstances surrounding the rejection of her requests to have the source of the marijuana established through forensic testing. The AFP have blocked her at every turn, over recent months recruiting long term Liberal Party donors, Clayton UTZ. On occasion, this has caused acute embarrassment. For example, they steadfastly refused to release documents which were already published on parliamentary websites, and others which had been obtained through alternative sources and already published by The Expendable Project. An example of the latter related to the astonishing exchange of correspondence between ex-AFP Commissioner Michael Keelty, and former Justice and Customs Minister Christopher Ellison. This revealed that both these individuals were well aware that Schapelle Corby's boogie-board bag was the only one not scanned at Sydney Airport. It had been diverted behind the scenes. This clearly vital information was withheld from both Schapelle Corby, and the Bali court. The correspondence also demonstrated that Ellison and Keelty were both fully aware of its value and importance. Whilst some of the correspondence was censored by the AFP, and exempted from release under the FOI Act, it was already being viewed openly on The Expendable Project website. Clayton UTZ sought to put a brave face upon this, finally volunteering it as though it was a simple reconsideration on review. This, however, represented only one of many hundreds of items being refused to Schapelle Corby, and indeed, thousands across a number of government departments. Diane Frola, who assisted Mercedes Corby at the AAT hearing, explained some of the hurdles being presented: "Schapelle cannot afford a lawyer. She has had to be represented by advocates, and by her sister, Mercedes. It isn't a level playing field but we are trying our best to obtain the information which will further prove Schapelle's innocence. They are desperate to hide it". Even the scope of the initial database search was problematic. 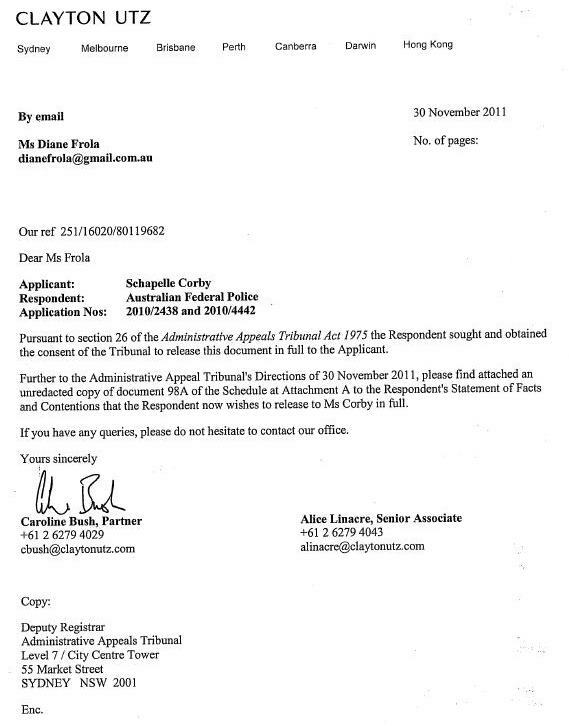 The AFP's FOI officer searched on the term "Schapelle Corby", yet the AFP routinely refer to her simply as "Corby". When pressed, they admitted that there were many documents whose existence were not recorded on the search, but subsequently refused to process them on the grounds that it was too much effort ("practical refusal"). It has already been established that Schapelle Corby checked her bags in underweight, but that they were subsequently found to be 5kg overweight on the Qantas system (more vital evidence, not presented to the Bali court). The AFP's disturbing relationship with certain journalists has also been uncovered, which was of significance in framing public opinion. Further, it has been shown that the AFP made a significant number of entirely false statements. But there is still more to it. "We know that they were blatantly spinning misinformation about the airports, in shifting attention from the shocking corruption, and wide scale criminality. This, of course, totally undermined Schapelle's defence. But it was just the start", continued Ms Frola. "The Indonesians were happy to engage forensic tests, until the AFP became directly involved. Then there is the involvement of AFP officers in airport drug syndication itself, as revealed by whistleblowers. There is the recording they suppressed of criminals discussing a marijuana pick-up from Sydney airport. There is the misinformation they were providing to Canberra, which undermined political support. There is even the manufacture of wholly unfounded smears and fabrications for press consumption. All these matters are already documented, and beyond any doubt"
A variety of pretexts have been used to censor the material, which have been regularly endorsed by a variety of government agencies and quangos, including the AAT. These include exclusion on the basis of personal opinions (even though those engaged were public servants, on duty, and on the payroll), public interest, and national security. The cost to the taxpayer, of maintaining this united front, has continued to mount, with seemingly, no expense being spared to frustrate the efforts of Schapelle Corby's family and prevent transparency.